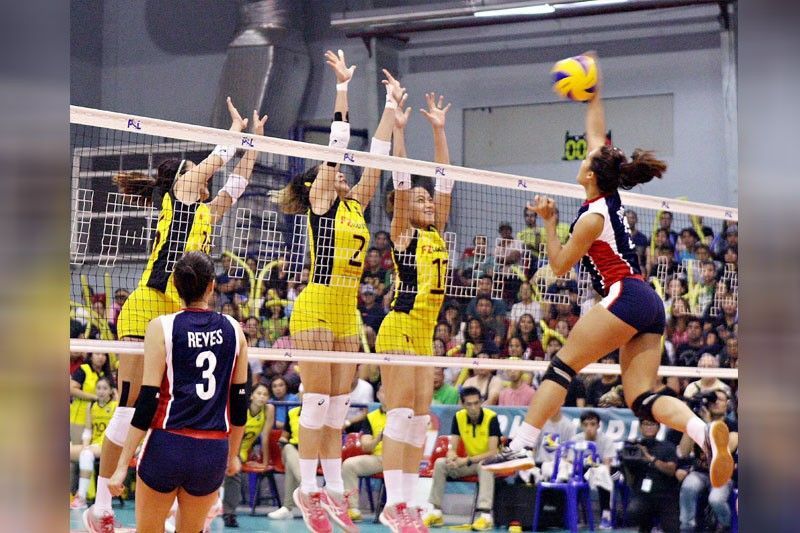 Bernadeth Pons of Petron Blaze Spikers delivers a devastating spike against the massive front wall of F2 Logistics’ Kim Kianna Dy, Abigail Marano and Cha Cruz Behag in one of the gripping moments of Game 2 of their title series in the Philippine Superliga Invitational yesterday at the Ynares Sports Arena in Pasig. MANILA, Philippines — F2 Logistics returned to the top after a one-year drought as it clinched the 2018 Chooks to Go Philippine Superliga Invitational Conference diadem with a hard-earned 25-18, 23-25, 25-23, 25-18 victory over rival Petron last night at Ynares Sports Center in Pasig. The Cargo Movers recovered from a second-set meltdown to get the job done and complete a 2-0 sweep of the of the Blaze Spikers in the best-of-three championship series that propelled them back to the throne after their last triumph in the 2017 Grand Prix. It was F2’s third overall conquest in the PSL counting their maiden crown in the 2016 All Filipino and this feat also avenged its bitter loss to Petron in the finals of the Grand Prix last summer. Aby Marano and Ara Galang took the cudgels and punched in 15 points apiece while Majoy Baron and skipper Cha Cruz Behag chipped in 10 each to lift F2 to a followup to its come-from-behind 18-25, 25-23, 20-25, 29-27, 16-14 thriller in Game One and a clear path to glory. Sisi Rondina struck with 20 and Bernadeth Pons had 10 in Petron’s losing cause. After a dominant first set, the Cargo Movers seemed poised to blow the Blaze Spikers away as they seized an 18-9 tear in the frame. But the Petron belles, with Rondina spearheading the fightback, mounted a furious rally, caught up at 22-all and stole the set at 25-23 to put Game Two back to square one. The Cargo Movers, however, regrouped and restored order in the third, with Marano leading them to a 23-17 cushion and eventually to the set win 25-23. Marano was on beast mode yet again in the fourth and joined forces with Cruz and Baron to put F2 ahead, 22-16, in the fourth. F2’s block party was on point throughout as the Cargo Movers extracted 13 points with their blocking game, getting six from Marano and three from Galang. This served as key to the triumph that levelled their head-to-head finals faceoff with Petron at 2-2.